2012 will probably be remembered as the year when the Open Access debate entered the mainstream and reached a tipping point: the Elsevier boycott and the Academic Spring; the Finch Group report on expanding access to research; the increasing number of venues and models offering open access options for authors, and publishers protesting that OA is potentially "catastrophic". Even the most ardent of OA supporters would probably agree that an exclusively 'green' OA model (i.e. unrestricted OA self-archiving) would be unsustainable in the long term, without fundamentally changing the model of peer-review and academic publishing. There are costs involved in scholarly publishing, and these must be paid for somehow - be it through public research funding and grants, (commensurate) subscription fees or author article process charges, depending on your ideological standpoint. "The consortium invited journals to bid for three-year open-access publishing contracts, and ranked them by an undisclosed algorithm that weighed their fees against their impact factors and the licences and delivery formats they offer. Under the deal, the journals will receive an average of €1,200 (US$1,550) per paper." The agreement will see 90% of the research published in the field made openly available from 2014 onwards. It's an interesting approach that essentially equates to libraries funding the 'gold' article processing charges typically paid for by authors in a co-ordinated way in order to provide access for all. However, the problem of moral hazard and free-riding casts doubt as to whether this mechanism is sustainable (what is the incentive for libraries to remain financial contributors to the consortium when they could still access the research free of charge?) or transferable to other disciplines where research is not typically concentrated across a handful of key journal titles. Furthermore, there is nothing to prevent publishers from increasing the fee paid per article for subsequent deals in the same way that subscriptions costs have risen. Perhaps most notable however, is that this approach maintains a direct link between libraries and the provision of access to research - in contrast with some of the alternative models (such as the 'author pays' approach or funding via public research agencies). If this traditional nexus is eroded, libraries may 'lose' one of their more obvious and visible roles. Obviously as librarians we know that we offer a lot more than simply providing access to subscription-based resources, but if libraries are cut out of the scholarly publishing chain, we may need to be much more creative and to work a lot harder in how we package and promote our more covert functions and services. A while back I wrote about an assignment support tool that we were working on. The idea here is to assist students in getting to grips with this little devil called procrastination; effectively, the planner presents itself as a tangible tool helping students in their struggle to get continuous assessment items handed in on time, by splitting the research/writing process into managable and carefully timed chunks. Each step directs users to resources that will support them, just-in-time, along the way. The tool lives on Moodle and was quietly launched there the other day. The new term starts next week and I mentioned the planner during inductions. The feedback from students and lecturers alike was very encouraging indeed. Some students approached me directly and enquired further about the planner. Below are three screenshots to give you some visual context here. If all goes well and usage is high, the planner will be refined and customised versions targeted at particular audiences. The IWCSA Workshop was held in May this year to discuss some of the emerging issues and problems surrounding authorship and attribution in scholarly publishing. With research impact and citation metrics playing a key role in many funding and grant applications, the need to increase the consistency and transparency in how collaborators, contributors and authors are identified and credited appears timely. Moreover, the changing landscape of dissemination has led to fluid formats and new channels where traditional practices may seem somewhat incongruent. One of the more striking statistics in relation to these issues is offered by Liz Allen at the Wellcome Trust, who reported that the number of authors listed on Wellcome Trust-associated genetics papers has increased nearly threefold between 2006 and 2010 (from 10.21 to 28.82). The potential for this kind of "author inflation" is also likely to increase as the number of largescale science consortium projects grows. Some interesting solutions are presented, including the development of a common taxonomy for contributor roles and 'authorship' types in scholarly publications. This would help ensure standardisation and consistency across disciplines and help identify the weight of contributions in multi-author papers. Data and databases are highlighted in particular as new units of scholarship that warrant attribution, and appropriate data citation standards would help support this. The authors also suggest developing a 'portfolio' approach to represent an individual's output and contribution, rather than the existing limited framework of metrics. No specifics are detailed in this regard, but no doubt elements such as altmetrics and qualitative measures could be incorporated. This approach could certainly prove valuable in capturing the richer and more diverse channels and roles inherent in scholarly publishing today, but the trade-off is that it may make at-a-glance quantitative comparisons over time or between researchers somewhat more tricky to distill. However if our current tools for measuring output are becoming increasingly disconnected from the new reality, perhaps this would not be such a great loss. After a 'summer' break, #irelibchat returns next Wednesday, 26th September 8-9pm, with the topic of information literacy as suggested by @johnmac38. Below are some suggested topics to steer the discussion but the chat will probably be a little more informal than previous sessions, so feel free to share any other ideas or questions relating to the theme. 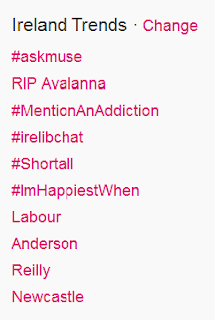 For those new to the concept of Twitter chats, simply search for the #irelibchat hashtag on Twitter to join in the dicussion, and remember to tag your own tweets with #irelibchat also. How do you identify the information skills and literacy needs of your users? What models or standards inform your information literacy/skills instruction? What skills do librarians need to support IL effectively? Do you use or share Open Educational Resources (OERs) in your IL instruction? What is the biggest challenge or change you envisage for IL instruction in the future? A couple of interesting links on the topic include a recent survey by @msnancygraham and @jsecker on Librarians, Information Literacy and Open Educational Resources and an article on Embedding information literacy skills as employability attributes from the latest issue of ALISS Quarterly. For more information on Twitter chats, check out How (and Why) to Participate in a Tweetchat. The new magnificent Newcastle City Library played host to this year's CILIP Big Day on Thursday, 13th September. Over 180 librarians, all members of the Chartered Institute of Library and Information Professionals, attended the special day which included the Annual General Meeting (AGM). Penny Wilkinson, Chief Executive of the Northern Rock Foundation, provided us with an overview of her career to date. She showed how her experiences let to her current role. The Foundation is part of the "Big Society" and aims at helping people to come together to change their own lives and communities. Penny noted that 24% of children and young people in the North East of England live in poverty and that her organisation is trying to support them by offering grants. She stressed the importance of professionals across different disciplines working together in order to achieve these goals. Mark Taylor of the Society of Chief Librarians reported on some preliminary results of a digital services survey conducted earlier this year in order to gauge the effectiveness of the SCL Digital Promise. This initiative sets a minimum standard for all public libraries across the UK with regard to digital resources. 80% of users felt that the support provided by their local library improved their level of understanding of online information. Mark estimated that libraries will have helped more than 3.5 million people over the lifetime of the challenge! Ann Rossiter, Executive Director of SCONUL, gave us "three reasons to be cheerful". She felt that we as information professionals lived in exciting times. Ann introduced three different fundamental changes in the field of Open Access which will impact on our work. She shared an example of a digital library in the form of the DPLA (Digital Public Library of America), which plans to make the cultural and scientific heritage of humanity available, free of charge, to all. Meta data is key to this project for librarians to decide what is currently available in which institution. Furthermore, a complete review of copyright will be necessary which will lead to new models of access. Ann foresaw a virtual marketplace where copyright for one digital resource can be "swapped" for another. She also advocated opening up the current model of peer-reviewed academic journals to one where the author pays a fee instead of the customer. Research Councils, for example, are funding projects with taxpayer's money, therefore the results should be accessible to all people within a couple of months. Ann finally called for the establishment of a National Digital Library for the UK and cited Scotland as a place where this is already happening. Her point was that with this transformation of power (away from LIS professionals towards the customers) our role as gatekeepers was no longer needed, but that we should embrace Open Access. The next point on the agenda was the AGM. This went smoothly - minutes from the last meeting and the treasurer's report were approved. A lot of work is going on behind the scenes with regard to the financial side of things, but membership subscription rates will be left untouched for the moment. After lunch Lord John Shipley, who is a member of the All-Party Parliamentary Group for Libraries and a former leader of Newcastle City Council, welcomed us back. He was behind the new library building and had a huge personal interest in getting children to read. He felt that libraries were key to that and advocated strongly a policy of access for all. To great applause he stated that "libraries are a sign of a civilised society". Phil Bradley then gave his presidential address - and this was probably the most powerful and inspiring speech I have ever heard! He started off by stating where CILIP was now highlighting its Professional Knowledge and Skills Base (PKSB) scheme and the fundamental changes the profession is undergoing at the moment. He then went on to defend librarians by saying that "volunteers can never replace professionals!" He emphasised our strong ethics and moral values which are at the heart of everything we do and which sets us apart from volunteers. We are trusted by our customers. Phil argued for a new campaign - not to "Save Our Libraries", but to improve and develop them. He noted that politicians do not care about libraries and librarians,and that we need to make sure that we are at the core of the communities we serve. He quoted R. D. Lankes who said that "Bad Libraries Build Collections, Good Libraries Build Services, Great Libraries Build Communities" (love that one!). My favourite part of his speech was when Phil claimed that we worked in a dangerous environment as we dealt with "scary information". People come to the library to question things, which is a very powerful tool for change. And not something those in power relish... He ended by underlining the importance of our shared values and ethics. After this tour de force we moved on to the "celebration of achievements" hosted by Annie Mauger, Chief Executive of CILIP. Information professionals, who recently gained CILIP qualifications, such as Certification, Chartership, Revalidation, Fellowship and Honorary Fellowships, were honoured. Some of these 210 individuals were present to receive their certificate from the President, including four of the five Fellows and two of the four Honorary Fellows. A reception and tours of the library followed which allowed us to mingle and network. It really was "a great day out"! For the full programme please visit the website. The Association of College & Research Libraries continuously scan for trends in academic librarianship and higher education. To do this they attend conferences, review the literature and contact experts in the field. Recently, they held a discussion forum to discuss these trends and come up with the most important trends affecting academic libraries today.The complete article can be found here. In these uncertain times, this trend appears likely to continue for some time. Funding bodies need to be given better reasons to support libraries. Possible ways they can do this are highlighting the correlation between library material usage with student grades and how library resources contribute to student and faculty success. The ACRL predict more repositories will emerge and many of them will be cloud based. Librarians will have a role in helping research committees design and implement a plan for data description, efficient storage and management. Many collections of rare or special content are being digitised. One worrying trend is that there is often the lack of a comprehensive preservation plan. Institutions are only beginning to realise that investing in digital collections requires an infrastructure to protect this content long term. Similarly, the management of born-digital content is also becoming a concern with parent institutions often not seeing the value in planning for the collection and management of such content. Student's desire to access social media and information anytime/anywhere, their acceptance of cloud based technology, and a new emphasis on challenge-based and active learning are all trends that impact libraries. New publishing paradigms such as open content challenge the library's role as curator. Game-based learning are mid term drivers of change while gesture-based computing as well as the Internet of Things (ubiquitous computing) are longer term drivers. A short term driver of changing the way library services are delivered and accessed in academic libraries are mobile devices. The EDUCAUSE Center for Applied Research found that two-thirds of students use mobile devices for academic work. The likes of EBSCOhost, JSTOR and Thomson Reuters have developed mobile interfaces and apps. Some colleges have replaced print textbooks and replaced them with tablets preloaded with course materials. This seems like an inevitable trend for libraries trying to cut expenditure. Academic libraries will start to jettison physical books with low circulation in favour of licensing agreements with ebook vendors that will enable libraries only to buy books that are in high demand. Primarily this is about efficiencies but can also be seen to be libraries aligning the library with the demonstrated demand of students. According to a survey from 2011, staff development and personnel are the top workplace issues for academic librarians. Data curation, digital resource management, scholarly communication and support for faculty instruction are all identified as areas that new skills sets are needed in. The ACRL have found that for students, libraries are not the first source for finding information. With the rise of Google, libraries are now competing for user attention. One way in which librarians can compete with their competitors is increasing their convenience. Convenient access to resources is still the most critical factor for students. As well as increasing their face to face availability, librarians can also increase their virtual help via instant messaging, social media and chat reference. 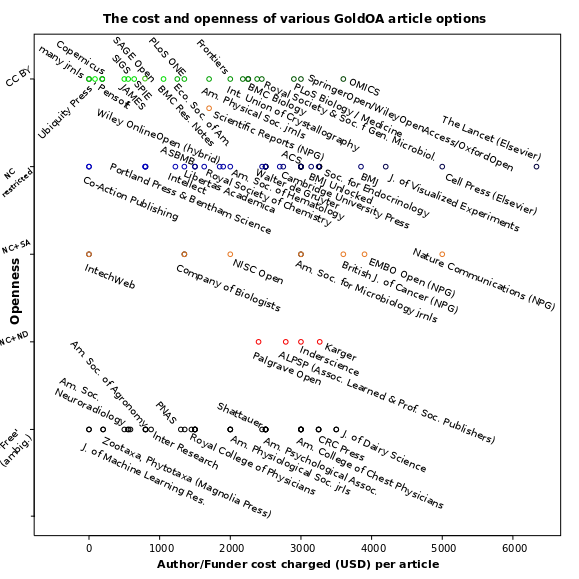 Government funding for gold Open Access: a quick fix for a bigger problem? Following the recommendations of the Finch Group report published last June (aka the Working Group on Expanding Access to Published Research Findings), the British Government has pledged to invest £10m to support open access to UK research. On the surface this seems like a positive development, but a longer-term vista may suggest otherwise. Firstly, the money is specifically for funding the article processing charges (APCs) of open access (OA) publications, reflective of the Report's preference for 'gold' over 'green' (self-archiving) OA. This recommendation in itself is questionable at best. Surely the emphasis should be on making research freely accessible at the lowest cost possible to the taxpayer (i.e. via OA self-archiving or OA publications that do not charge APCs)?. Obviously in the long-term there are commercial sustainability arguments regarding green OA, but given the healthy profits in many scholarly publishing houses it does not seem to have had any visible effect as yet. If it does start to bite, it may even help to reform the existing business model of academic publishing which may necessarily be a bad thing; for instance, freed-up subscription funds could be used to pay for the costs of the peer-review process. Secondly, if other institutions or governments follow suit and start to allocate funding for APCs, all this is likely to do is to fuel such charges even further. If publishers see that there is plenty of money available to pay these fees, the logical commercial reaction is to raise the price. Is the British Government's decision just going to be the start of escalating APCs for OA, in place of rising subscription costs? Some may argue that mandating green OA forces authors to choose one of the 60% or so of publications which permit self-archiving, but gold OA is similarly restrictive as not all publications offer a pure or hybrid OA model. Thirdly, ultimately this £10m is not 'extra' money - it comes at the opportunity cost of something else, in this case additional research which could be funded and still made openly accessible via self-archiving. Publishers will argue that pre- or post-prints are not of a high enough quality for users' needs, but many researchers would disagree. Promoting green OA, whilst not perfect or sustainable in the longer term, would support the scale effects and critical mass that is essential for gold OA to work in the future. To ignore this step, is failing to see the bigger picture. Information Literacy (IL) is a hot topic in the Library and Information Science (LIS) research community. There are many different ways of conducting studies into IL. This post outlines some current IL research using Phenomenography as reported at a recent conference. The European Association for Research on Learning and Instruction (EARLI) has 22 special interest groups. One of them, SIG 9 Phenomenography and Variation Theory, held its meeting on 27-28 August 2012 in Jönköping, Sweden. Phenomenography is a qualitiative research approach, which helps investigate people's different perceptions of a phenomenon and is therefore suited to explore conceptions of IL in a diverse set of circumstances. Even though the main focus of the conference had been on research into learning using Phenomenography and Variation Theory, two papers reporting ongoing research came from the LIS field. Clarence Maybee, Information Specialist at Purdue University in Indiana and also doctoral candidate participating in a joint programme of QUT and San Jose State University, looked at how undergraduate students learn to use information while they engage with course content. He examined how teachers and students use concepts of "informed learning" in their classrooms. The core idea behind "informed learning" is that "using information and learning happen(s) simultaneously". The programme and abstracts can be found on the conference website. If you use the Internet, you know and likely love Wikipedia. But have you ever asked yourself how reliable an effectively "crowd-sourced" information point is? Epic, a bespoke e-learning company, and the University of Oxford recently released their comparative pilot study on the efficacy and integrity of content published by Wikipedia. A sample of 22 Wikipedia English-language articles was compared to corresponding articles in Encyclopaedia Britannica. The study also looked at Spanish Wikipedia vs. Enciclonet and Arabic Wikipedia vs. Arab Encyclopaedia. Before I go into the report’s findings itself, here’s a brief re-cap of how Wikipedia operates and what its chief English-language competitor – Encyclopaedia Britannica – thinks. Anyone with access to the Internet is encouraged to contribute. Readers of Wikipedia items “can edit the text as he or she sees fit, anonymously or with a user account” (Wikipedia, 2012). How does this work in practice? Wikipedia operates around the concept of consensus editing based upon open-community derived policies and guidelines. The fundamentals are summarised in the form of five pillars as follows: Wikipedia is an encyclopaedia; Wikipedia is written from a neutral point of view; Wikipedia is free content that anyone can edit, use, modify, and distribute; editors should interact with each other in a respectful and civil manner; Wikipedia does not have firm rules. The last point of “no firm rules” is important in the sense that entries on Wikipedia revolve around the idea of an open dialectic. Knowledge creation through Wikipedia is open for all, under continuous scrutiny and subject to active stress testing by anyone out there engaging with the subject matter at hand. Compare this approach to Britannica, where contributions are exclusively received from commissioned experts and scholars. Entries are subject to tight editorial control. For obvious reasons (such as the lack of disciplined editorial review and the fact that entries can be made by anyone), Britannica vehemently disputes the idea that Wikipedia should be considered a viable alternative as suggested by Nature back in 2005. Nature’s study looked at 42 pairs of scientific articles from Wikipedia and Encyclopaedia Britannica respectively, all of which were of similar length representing broad disciplines (see details of how the survey was conducted). Each pair of selected entries was reviewed by experts who looked out for factual errors, critical omissions and misleading statements. 123 were found out for Britannica, 162 for Wikipedia. Based on those results, Nature argued that Wikipedia comes close to Britannica in its coverage of scientific topics. Britannica criticised Nature’s findings as fatally flawed based on the argument that its methodological approach and conclusions were unsound (you can read the full demolition of Wikipedia by Britannica here). In return, Nature dismantled Britannica’s charge of flawed analytics in a point-by-point rebuttal (see here). Assessing the veracity of Wikipedia, which in essence is the embodiment of an inclusive social project built around the idea of empowering an open, knowledge-based society, is complex and by no means a simple task. That’s why Epic/Oxford decided to repeat the exercise, albeit using a more complex methodological approach. Explore the opinion of expert reviewers regarding attributes relating to the accuracy, quality and style of a sample of Wikipedia entries across a range of languages and disciplines. Compare the accuracy, quality, style, references and judgment of Wikipedia entries as rated by experts to analogous entries from popular online alternative encyclopaedias in the same language. Explore the viability of the methods used in respect of the first two aims for a possible future study on a larger scale. Emphasis is put on testing a methodological approach that will stand up to scrutiny as the foundation for a large scale study. For this purpose, a special feedback tool was devised that provides reviewers (all experts in their respective scientific fields) with a wide range of quality criteria, drawn from extensive previously published research (Epic/Oxford, 2012). A sample of twenty-two articles was subject of this pilot study; five dimensions for assessment were devised: i) accuracy, ii) references, iii) style/ readability, iv) overall judgment (including citability), v) overall quality score. The bottom line is that the pilot indicates that Wikipedia scores rather well in relation to the majority of the five variables above when compared to rival encyclopaedic entries. However, considerable challenges were noted concerning the identification of appropriate articles fit for comparison, anonymising articles, and recruiting a sufficient range of suitable reviewers if a large scale study was to be embarked upon (Epic/Oxford, 2012). For this reason, Epic/Oxford recommends that more research could be done on how users interpret and make sense of content from online encyclopaedias in general and from Wikipedia in particular (Epic/Oxford, 2012). This conclusion is an important one as it highlights the complexities involved in objectively assessing crowd-sourced information points, such as Wikipedia. This important pilot also opens up the discussion on the validity of information and research acquired via non-traditional means. Despite the challenges noted above, is it time for academic and perhaps commercial content producers to start re-assessing their guarded relationship with Wikipedia compared to their open embrace of commercial alternatives? The University of Tampere hosted this meeting from 8th -10th August 2012. There were many inspiring papers, posters and presentations. Carol Kuhlthau gave the final keynote speech. She drew on her famous model of the information search process, which she combined with Guided Inquiry. Guided Inquiry is based on a constructivist view of learning. The aim was to provide a framework for collaborative learning. Kuhlthau hoped that this model could provide a way for librarians to help students and other learners through the inquiry process. For Carol's presentation and some of the other papers please check the website.